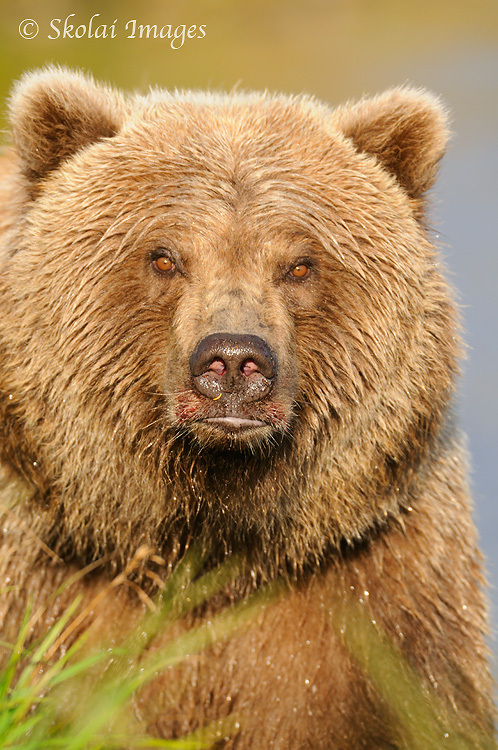 A grizzly bear (Ursus arctos), close and personal, Katmai National Park and Preserve, Alaska. Click the image for larger version. In honor of the recent decision (last week) by Judge Molloy of Montana to continue to have the grizzly bears listed under the Endangered Species Act (in the Greater Yellowstone Ecosystem), here’s a grizzly bear photo, from my recent trip to Katmai National Park and Preserve, Alaska. In September the Court ruling was for the US Fish and Wildlife Service to relist the bears, but the F&WS requested the judge to reconsider. He reconsidered, and turned down their appeal, so the bears remain, for now, on the ESA. I’ll write a lengthy post about it later; for now I’m going to bed. I think September was a good month for the bears – the same day Molloy handed down his ruling in Montana, I took this picture in Katmai National Park and Preserve! I got lucky a few mornings with some nice light, which was a treat, and some nice bears, which made it even better. 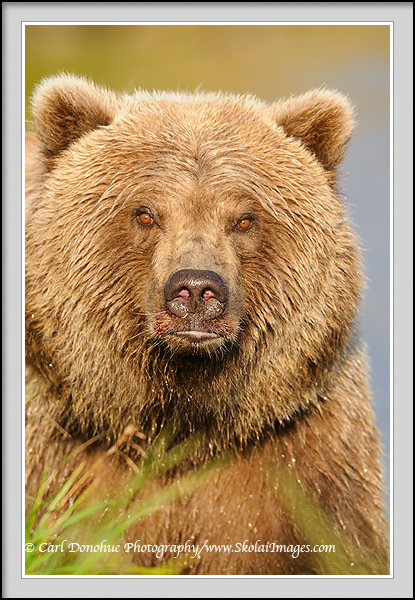 I can’t wait to go back next year for the grizzly bear photo tour. This entry was posted in Alaska, Environmental Issues, Grizzly Bears, Katmai National Park, Wildlife and tagged Brown bears, grizzlies, Grizzly Bears, Katmai National Park and Preserve, Ursus arctos on November 26, 2009 by Carl D.
Thanksgiving, when Wrangell Mtn grizz’s go to bed, something to be thankful for. Good to see the great bear get his due…protection. Up close is wonderful as long as it’s smiling. That is “good” news Carl. Although the goal should be to get as many species off the ESA as possible, we certainly seem to fumble over ourselves when that does happen. It seems the post ESA life of so many species is lacking protections that got them listed in the first place. Hey Mark Graf – you sure nailed that – we fumble all over ourselves.